Green Bay, Wis. — The University of Wisconsin-Green Bay History program has received the University of Wisconsin 2018 annual Regents Teaching Excellence Award (in the department/program category). Watch the video of the award presentation. “UW-Green Bay History was selected from among a select group of candidates, all of whom demonstrated an impressive dedication to teaching and an ability to inspire students with an enthusiasm for learning in general and for making interdisciplinary connections in the classroom and beyond,” the letter stated. 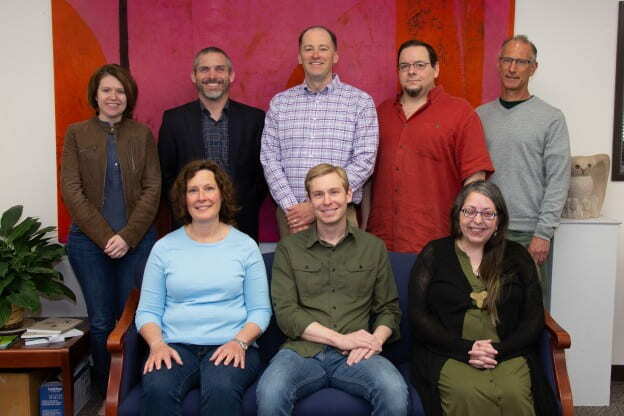 Dedication to the scholarship of teaching — of the 12 members of the history faculty, 10 have participated in year-long Scholarship of Teaching and Learning program (SoTL) programs — either the UW-Green Bay Teaching Scholars or the UW System Wisconsin Teaching Fellows & Scholars (or both). Through these programs, the faculty have worked with a cohort to discuss best practices in teaching and to carry out a research project on their own students’ learning. Further, Profs. Greg Aldrete and Clif Ganyard have won the University of Wisconsin System Regents Award for Excellence in Teaching. Digital learning and instruction — Members of the history faculty have piloted and applied many new technologies for teaching, including blogging, classroom response systems (“clickers”), Second Life (virtual reality), podcasting, Twitter re-enactment, online cataloging (Omeka), digital animation, and film-making. Experiential Archaeology — In this hands-on history approach, students learn about the past by trying to replicate how things were done in the ancient and medieval world. UW-Green Bay has an international reputation in this field, with Prof. Greg Aldrete’s reconstruction and testing of the Linothorax, the linen armor worn by Alexander the Great and his army; Prof. Sherman’s five-year “Flax Project”; and “the UWGB Viking House,” which is a reconstruction of a 1,000-year old grindbygg (Norwegian trestle-frame construction) donated to and rebuilt on campus in the fall of 2017. Internship growth — Over the past several years, a growing number of history majors are pursuing internships. In 2011-12, 24% of graduating History majors held an internship. In 2016-17, the number had grown to 43% offsite internships. The recognition comes with a $5,000 stipend to be used for professional/and or program development activities that you believe will enhance the work of your department. The award will officially be presented at the June 8, 2018 Board of regents meeting at UW-Milwaukee. The University of Wisconsin-Green Bay is a comprehensive public institution offering undergraduate, graduate and doctoral programs to 7,158 students. The University transforms lives and communities through exceptional and award-winning teaching and research, innovative learning opportunities and a problem-solving approach to education. For more information, visit www.uwgb.edu. This entry was posted in News Releases and tagged CAHSS, History, humanities on May 10, 2018 by Sue Bodilly.